In the first part we discussed the origin of the Forex Fibonacci sequence, which was originally presented along with the Hindu–Arabic numeral system in the book ‘Liber Abaci’, by Leonardo Pisano, nicknamed Fibonacci. In Fibonacci’s original sequence each number is the sum of the two previous numbers: 0, 1, 1, 2, 3, 5, 8, 13, 21, 34, 55, 89, 144, 233, 377, and so on. Dividing one number by the number that follows creates the ‘Golden Ratio’ (φ=1.618), for instance: 8/13 = 61.53%, 34/55 = 61.81%. 23.6%, 38.2%, 50%, and 61.8% Fibonacci levels play important roles in the financial markets, and those are used to define critical points that cause price reversals. Fibonacci retracements help to indicate strategic places for market entries and stop losses, and also to determine areas of support or resistance. This second part covers arguably the most powerful and easy to understand application of Fibonacci in trading on the Forex market. Here we can see that price was in a downtrend before bouncing and retracing exactly 38.2% of the move from high to low. 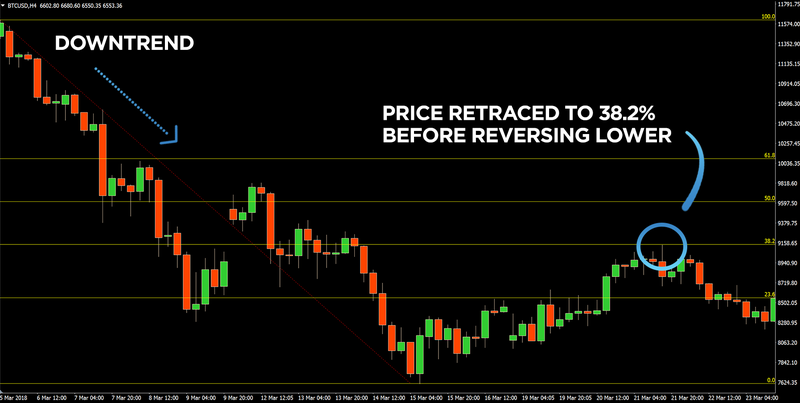 After reaching the 38.2% Fibonacci level, the price reversed and traded lower, the direction of the overriding trend. Looking at the chart you can see there are several different retracement levels marked: 23.6%, 38.2%, 50% and 61.8%. They all represent potential resistance levels in the context of a retracement of the down move. As such these levels all represent potential entry points to rejoin the down trend. This means we have four potential reversal points to enter the market. But which level should you choose? This is where knowledge of technical indicators and price action can help you. Looking at the chart above, we can see that the stochastic oscillator gave us a clue that the market was going to reverse. 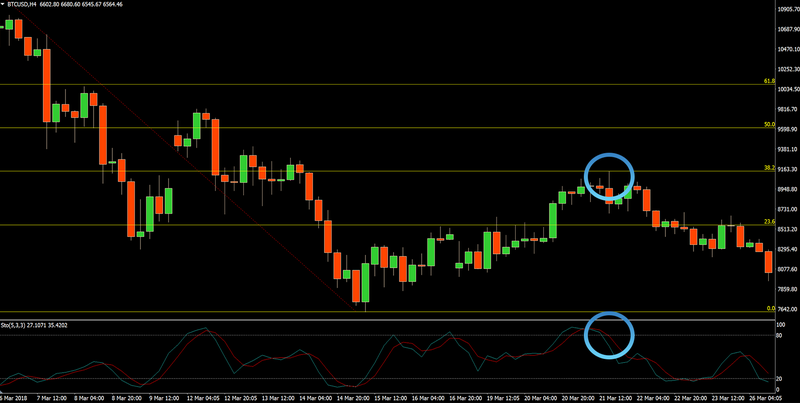 Stochastics were above the 80 level and curving lower, which is a bearish indicator. So with price up at the 38.2% retracement level and stochastics giving a sell signal, we’re starting to build a good case for placing a sell order, or ‘going short’ as it is called in the trading industry. A good trader is a bit like Sherlock Holmes, a detective building up a case based on multiple clues. We’ve uncovered two good clues for taking a short position, but we’re not done yet. Zooming out for the bigger picture and looking at the daily chart above, we can see that the trend is broadly downward on this timeframe also. This further supports the case for selling Bitcoin at the 38.2% Fibonacci retracement level. For short positions (sell trades) we want to see that the market is in a downtrend across multiple time frames. For long positions (buy trades) we want to see that the market is in an uptrend across multiple time frames. The bounce off the Fibonacci level on the four-hour chart was a relatively large one. The 38.2% level was at 9119 and price sold off all the way down to 8190, a move of over $900. This is a Forex strategy that can be applied across different time frames. For example, you could look for similar set-ups on a 30-minute chart, instead of the four-hour chart we’ve used as an example. Keep in mind that on the shorter time frames you’ll get more signals but they will be less reliable. Conversely, on the longer time frames you will get fewer signals but they will be more reliable. To enter the Forex market at the Fibonacci retracement levels you can place a sell stop order (in the case of a retracement of a down move) or a buy stop order (in the case of a retracement of an up move). Alternatively, you could opt to place the orders manually with a market order when the price reaches the Fibonacci levels. A good rule of thumb is to set a profit target of at least three times your risk. So on the Forex trade described above, we could have set our risk to $200 with a profit target of $600. Fibonacci retracements will help to estimate support and resistance areas, but the best use of the tool you can get by combining it with other indicators and Forex strategies. 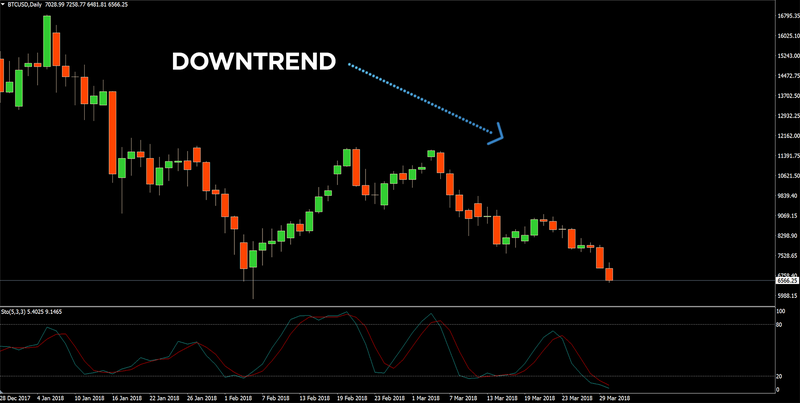 For instance, you can take advantage of the stochastic oscillator to define a trend and price reversal. Fibonacci retracements are a trend-following instrument, and looking at the trend across multiple timeframes will obtain a more accurate forecast. Fibonacci retracements make a great confirmation tool and can ensure high probability trades in conjunction with strategies presented in this article. We hope you’ll find the best way to trade using Fibonacci retracements.